If you would like to keep your Siberian Husky puppy indoors at times, then housebreaking is an early and essential training activity to perform. 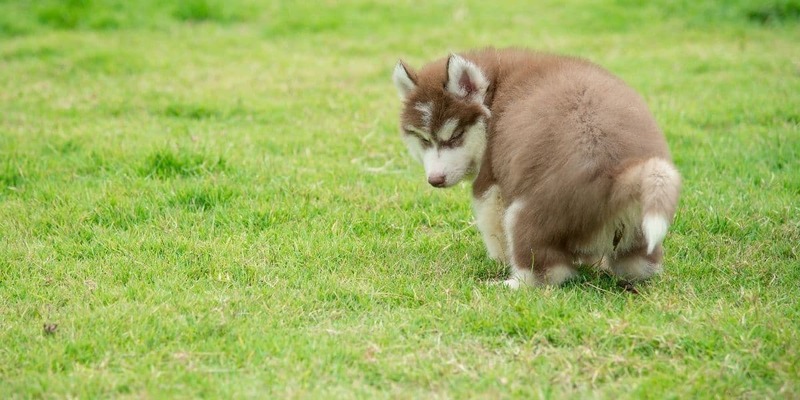 Whether you call it housebreaking, toilet training, or potty training, all Husky puppies can be trained to do their business outside, and not all over your nice clean floors. 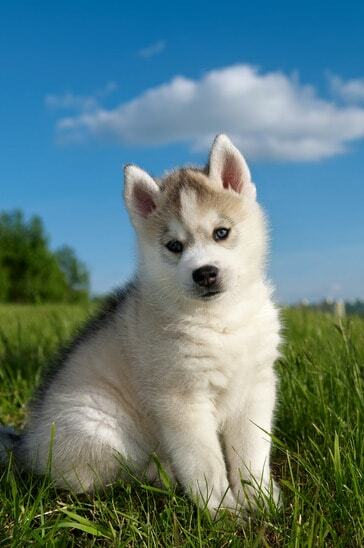 You are probably going to start housebreaking your Husky puppy at around 8 weeks old (2 months old). It is about this time that puppies develop the muscle behavior to control themselves. Attempting to train younger puppies could prove futile. This will be amongst the first formal training you will do with your puppy and if you can get this right, you will earn his or her trust for future training. Head outside and find a spot in the garden where you would prefer your dog to do its business. Your puppy will prefer to return to a spot that it has already ‘marked’. Make sure it’s out of the way of human foot traffic so that you don’t start stepping in things you don’t want to! Housebreaking can take a little time. You should hopefully start seeing results after a couple of weeks, but if not do not give up! Siberian Huskies are independent dogs and can be a little stubborn to train. Once routine is setting in there is likely to be occasional accidents for a little while longer. You need to be patient. Also be aware that puppies are growing in their first few months – which means lots of food going in, and a lot has to come out! A dog crate is a closed container (typically plastic) that the dog can be confined to. Think ‘cage’ but use the more politically correct term ‘crate’. Don’t worry, crate training is recognized by the Human Society as an effective aid to housebreaking a pet. The crate will be used as a training device for short periods of time. It is most definitely not a jail used to punish your puppy! The purpose of the crate is to confine your dog when you can not keep an eye on it, such as doing a chore around the house or ducking out for an errand. Because of the likelihood of the dog resting or sleeping in the crate, they are unlikely to do their business in there. If you let your puppy roam the house they could make their ‘deposits’ anywhere they feel like it. Obviously you need to get a crate large enough for your puppy to fit in to, with room to grow. For a Siberian Husky that might mean going for an extra-large sized crate. You also might want to floor the crate with newspaper or absorbent material to aid in any little mistakes. A small amount of water and a toy could help comfort your pet. Huskies might be used to the cold but if you have a spot in the house that isn’t too drafty that would be ideal. They prefer a relatively warm and still place to rest. Initially you might only keep your puppy in the crate for 30 minutes. Over time, say from 8 weeks to 18 weeks of age, you can build up the maximum confinement from 30 minutes to 5 hours. That is approximately an extra 30 minutes each week. After opening the crate, put a leash on your puppy and take him or her out to ‘their spot’ in the garden. They might not need to use it but they will learn the routine of restraining themselves while indoor, and relieving outdoors. If you see your puppy begin positioning itself to do its business, a firm ‘NO!’ will grab the dog’s attention. You can pick your puppy up and move him to the spot outdoors to complete the job. After your puppy does its business be sure to give strong positive feedback – ‘good dog!’ with scratches behind the ear and cuddles. This should be done immediately (within seconds) so that the encouragement is linked to the behavior. Avoid negative feedback – the added attention will confuse the dog. If a mistake is made, never push your dog’s face in to a ‘mistake’ made indoors. The puppy doesn’t know any better while it is learning. Just take your dog outdoors to remind him or her of their place, and in your own time quietly clean up the mess indoors. You will probably notice that your puppy likes to relieve him/herself when it wakes up, after meals, and perhaps after exercise. You can aid in the training by taking the puppy out to its spot after these times to encourage routine behavior. If your puppy shows signs he/she wants to head outside, that’s great! They are learning. So take them out, let them do their thing, and again lots of positive encouragement. You might need to do a few trips out at night but rest assured, as the puppy grows larger and behaviors are learnt, they will be able to restrain themselves for longer periods of time. That’s pretty much all there is to it! Start at around 8 weeks, and use a crate for 30 minutes at a time, adding 30 minutes each week up to 5 hours. Give lots of positive feedback, no negative feedback, and most of all, be patient. 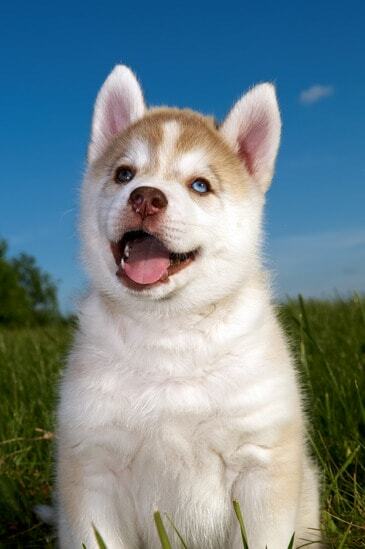 The effort you put in now will pay off for the life of your Siberian Husky puppy.